Interceptors is a new word in performance boat technology but they present a new way of controlling the attitude of vessels. They replace flaps, or trim tabs as they are sometime called but they are more effective in controlling the fore and aft trim of the boat and what is one of the most important features of interceptors is that they are fast acting. They were first introduced on some last, fast, monohull ferries where flaps would be too large and add too much weight to be viable. The compact interceptor installation is now ell proven on these ferries and now interceptors are being tried on smaller craft with very favourable results. Instead of using a hinged flap attached to the transom as is the case with flaps, an interceptor is a metal plate attached vertically to the transom that can be lowered vertically so that it projects just below the transom. Here it intercepts with the water flowing under the hull, hence its name, and this interruption of the water flow generates lift at the stern. 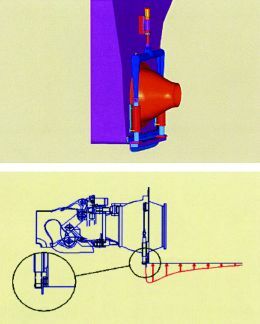 The diagram shows how this lift is more effective than that generated by a flap and this lift can be used to alter the longitudinal trim of the vessel, allowing it to be optimised for the speed and the sea conditions. At maximum setting, the interceptor only projects a few centimetres below the bottom of the boat so that the added resistance is minimal and is no more than that generated by a flap. There are three types of interceptor currently being offered on the market today. 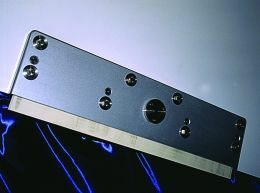 The metal plate that is moved vertically up and down is produced by LA.ME srl. Large units of this system operate under hydraulic control but LA.ME has recently introduced their Sea Lifter system designed specifically for yacht in the 20 to 30-metre size range. This is a particularly compact system that is electrically operated by a patented drive system making this a simple installation. In the LA.ME interceptor systems the interceptor plate remains parallel to the hull bottom as it moves up and down. A second type of interceptor is still a vertical plate but this is hinged near the centre line, so that the hydraulic control only lowers the outer end. 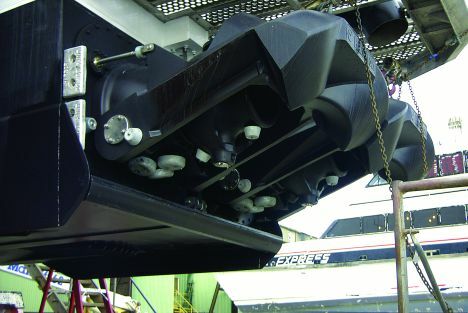 This type of interceptor has been developed by Rodriquez Marine Systems, a company that produces a wide variety of ride control systems for fast ferries. This type of hinged system is simpler than the LA.ME system in some respects and is particularly effective where is necessary to use the interceptor to control the transverse trim of the vessel because the main trimming effect is at the outer edge of the transom. The Rodriquez system is offered for fast ferries and yachts and one of the first yacht installations has been made on the prototype Azimut 98 Coupe. Rodriquez offer the possibility of incorporating trim sensors into the operating system. 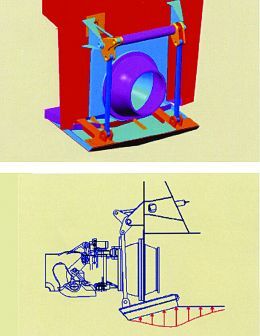 With computer control, this interceptor system then becomes an automatic stabiliser system that is particularly suited to high performance craft because of its minimal resistance. It is in this stabiliser application that the quick action of the interceptors is of great benefit, with the response to trim commands being almost immediate when compared with slow acting flaps. The third type of interceptor is produced by Maritime Dynamics in the US, a company that is a subsidiary of Vosper Thornycroft in the UK. Their system uses rotary interceptors rather than the vertical plate type, and this gives more subtle control of the trim action. The interceptor here is hook shaped in cross section and the rotary action under hydraulic control brings the bottom of the hook down so that it intercepts the water flowing away from the transom. In its fully extended form the hook plate moves beyond the vertical but it is, in effect a vertical plate. The rotating action gives a smoother operation that the rather brutal operation of the plate type of interceptor. Maritime Dynamics offers their interceptors as manually controlled units or as part of a full, computer controlled stabilising package suitable for craft of 20 metres and upward. Like flaps, the longitudinal trim is adjusted by lowering both interceptors at the same time. This setting can be used to lower the bow and this can be particularly useful when operating in head seas. By lowering just one of the interceptors the transverse trim can be adjusted and this can be useful in beam wind conditions. The interceptors can also be used for steering control by lowering one or other of the interceptors but this is only fully effective at higher speeds. However interceptors could provide a useful emergency steering system. For the future, interceptors off the possibility of a full automatic ride control system for fast craft. With interceptors fitted at the transom and at a point around halfway along the hull, an interceptor system could be used to control both pitch and trim, The fast operation of the interceptors is possible because of the minimum movement required to generate quite considerable trim forces. Such an integrated system could incorporate the steering as well and some fast ferries have fitted vertical interceptors at the stern to get maximum steering effect. Current interceptor systems tend to be limited to craft above 20 metres but one of the first installations of interceptors on small craft has been on 12 metre fast RIB lifeboats built for the Swedish Sea Rescue Society (SSRS). These lifeboats are built on a deep vee hull and a test run in one of these lifeboats showed just how effective the interceptors can be in controlling fore and aft trim. The fast response of the interceptors and their joystick control allows the trim of the boat to be adjusted for each individual wave. Of course, this type of control requires considerable concentration but they do offer the coxswain the possibility of a response when meeting large or freak waves. On the Swedish lifeboat installations, the operation of the interceptors has been speeded up for a quick response. These interceptors have been developed to their own design but are of the vertical plate type. In these installations the interceptors are an integral part of the twin Rolls Royce FF Jet water jet installation and use the same hydraulic system as the water jets. This allows them to be used on a continuous basis for trim control. The successful use of interceptors on these 12 metre lifeboats has lead to them being specified for the latest 22 metre all weather lifeboats that are now building for the SSRS. The prototype of the 22- metre design, which is capable of 37 knots, is reported to be operating very successfully with the interceptors contributing to the performance. This lifeboat design is one of the fastest all weather lifeboats operating anywhere in the world. This use of interceptors on the Swedish lifeboats is a tough testing ground and it could point the way to a much wider use of interceptors on smaller fast craft. Not only do they offer faster and more precise control of the trim and the option of an alternative steering system, but they are also more compact, virtually fitting within the hull length. This pioneering experience should give confidence to builders in the leisure and commercial markets to use this new system. The use of interceptors as part of a fully integrated ride control system opens up the possibility of a new era of ride comfort in smaller high performance craft.